Jimmy Carter’s presidential campaign against Gerald Ford sought to lift the U.S. economy from its slowdown in the second half of 1976. Carter’s currency policy was famously based on the talking down of the U.S. dollar, especially through his outspoken Treasury Secretary Michael Blumenthal, who pressured the Fed into monetary policy easing. The slide was accelerated in June 1977 when Blumenthal talked down the dollar after a meeting with his German and Japanese counterparts. The new policy sent the dollar tumbling more than 20 percent between January 1977 and October 1978, a dramatic plunge by postwar standards. The chart shows how the dollar tumbled 38 percent against the Japanese yen as Japan’s trade surplus soared on its burgeoning exports industry. 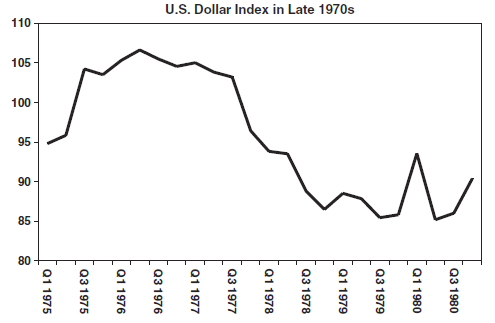 The chart illustrates the 22 percent decline in the U.S. dollar index from its 1976 peak. United States had embarked on a gradual tightening policy starting in early 1977, Germany and Japan were in the midst of an easing campaign that lasted well into 1978. From summer 1977 to autumn 1978, U.S. interest rates nearly doubled from 5.9 percent to 9.5 percent. In contrast, German and Japanese rates fell from 4.5 to 3.5 percent and from 5 to 3.5 percent, respectively, tripling the yield advantage in favor of the U.S. dollar. 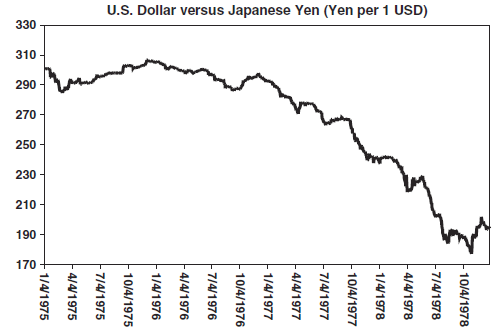 So why did the dollar damage occur when the U.S. currency had yielded substantially higher rates than its German and Japanese counterparts? 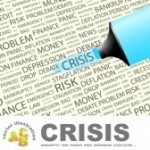 The answer lies in Carter’s policy of targeting a 4.9 percent unemployment rate, following the stagflation days of the Ford administration where unemployment breached 9 percent and inflation crossed over 11 percent. As Carter pursued his unemployment target via major fiscal stimuli, inflation headed back up and so did the budget deficit—the two bogeymen of financial markets. Inevitably, confidence in the dollar continued to erode. In November 1978, the United States mounted a massive joint intervention with Germany and Japan to buy dollars against foreign currencies. The move was supplemented with a 100-basis-point increase in the discount rate, the biggest in 45 years. The coordinated intervention proved limited in stabilizing the U.S. dollar. It wasn’t until the Fed rewrote the rules of monetary policy management to combat soaring inflation in late 1978 that the currency began to turn around.